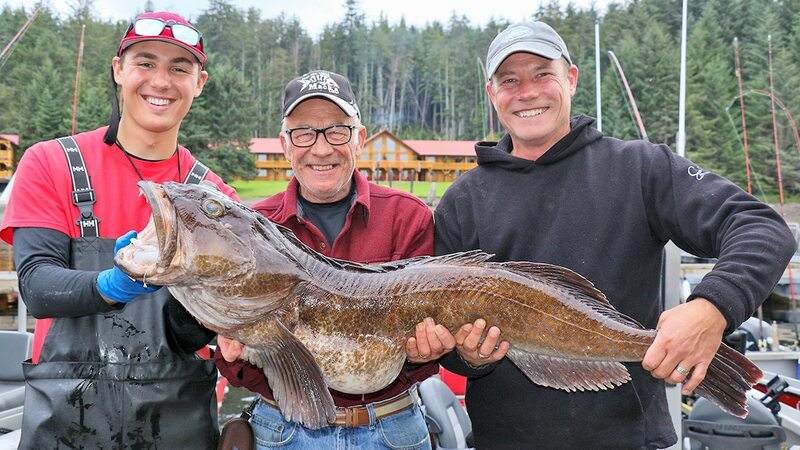 Last week we were talking about “special combo” fishing and the great variety of fishing experienceLast week we were talking about “special combo” fishing and the great variety of fishing experiences there are to be had up here. 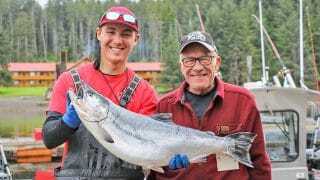 Well this week we had a father & son angling team at the lodge that really took it to heart! Ronald and Dan R not only found the variety but, with the help of their QCL guide Jake Harrach, they found the quality as well! Over the past 4 days they managed to catch the largest fish of the trip in each of 3 species and the 2nd largest in a 4th! On Tuesday Dan caught and released the big halibut of the trip, a big slab that taped out to 163 pounds. On Wednesday Ron boated a nice big lingcod that tipped the scale at 35 pounds which, in most weeks would be the big one! But he came second to a 50-pounder landed by Lino P! That’s only 6 pounds short of the lodge record! Congrats Lino! On the same day Ronald caught the largest Coho of the week, coming in at 16-pounds – a beautiful fish for sure! Then on Thursday, making that famous “just one more pass” at Cape Naden on the way in, Dan hooked up with a big Chinook that really put him to the test. After a twenty-minute tussle, Jake slipped the net beneath the chrome beauty and they knew there would be some more Bell-ringing back at the dock that night! 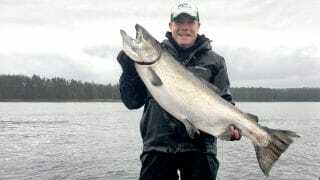 At 39-pounds, this big Tyee would add to Dan’s record of success as the largest Chinook of the trip. Congratulations guys! That’s an amazing catch report! It’s a good thing you’re going home for the weekend to get some rest! 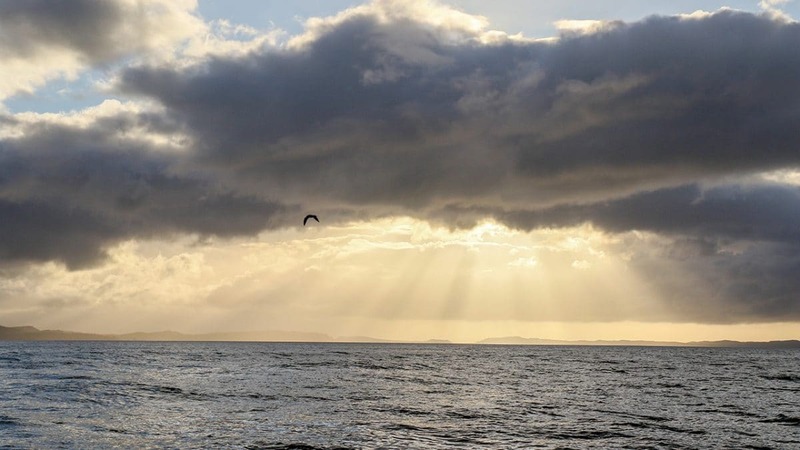 The weekend forecast is for more southerly weather and calm seas (with a regular dose of liquid sunshine.) The inshore Chinook fishing has certainly picked up in the past week with the best action during the first and last hours of the day. Offshore the Coho catch remains strong and we’re seeing more of the larger Coho coming to the scale. Bottom fishing has been getting easier with the tidal range diminishing every day since Monday’s new moon. QCL anglers released 6 halibut over 100 pounds this trip and we’re still seeing nice 30-plus fish at the Bell Ringer every night. These are great days to be fishing at QCL!